Are they a viable option for the electric kick scooter fan looking for something more extreme? The likes of ZBoard, Boosted Board, and other e-skateboard variants have come to notability through successful kick-starter campaigns and have slowly begun production. I decided to take a brief look at some of the variants of these boards and compare them with the likes of the electric scooters available in Singapore. One of the more unique boards developed, the ZBoard is operated through foot pad pressure mechanisms. It weighs in at 33lbs and can travel at a max speed of 15MPH, allowing for a good amount of speed, and a range of 5Miles for the classic version. While allowing the users hands to be free, it may come at the sacrifice of security as a miss-step on the foot pads could send you going in the wrong direction. A further issue is that the large visible battery pack may not be pleasant to some. The ZBoard is sold in the USA and queries on the shipping cost puts it at US$250 for shipping to Singapore, putting a damper on hopes of bringing this in at a low price. The boosted board is yet another product developed in the USA which garnered support through a kick-starter campaign (https://www.kickstarter.com/). The board purportedly capable of traveling at a max speed of 20mph, is operated through a remote control and has a light weight of 15lbs (half that of the ZBoard) and a battery that is barely visible, allowing for ease of portability. 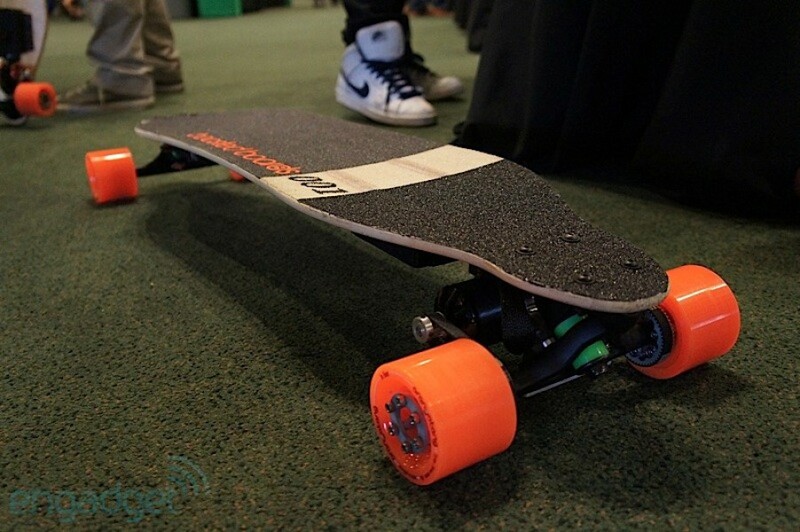 However, the board falls short on its ability to last, having an estimated range of only 6miles (~9km) and due to its plastic skateboard wheels, a ride on rough terrain is not expected to be smooth. The board has been in development for sometime and is yet to be commercially available. Check them out at http://boostedboards.com/ ! For the individual whom has little experience with skateboarding, these boards may have a steeper learning curve compared to the likes of electric scooters, as the only option to control these skateboards is through adjusting your overall weight on the board. Due to this turning mechanism, wobbling on a skateboard is likely. Electric skateboards are an interesting addition to the various options of mobility transport, and may be a viable choice for someone looking for a bit more of a thrill. A challenge of all skateboards which will persist is the turning radius. Given the large number of pedestrians around and narrow paths, we feel the ability to do sharp turns and sharp brakes without issue has a strong factor in determining the viability in crowded Singapore. Let us know what you think! Electric scooters readily available in Singapore include the MyWay sold at http://www.falconpev.com.sg/ and the GoBoard & E-Twow at http://www.sgelectricscooters.com/.